This was tricky. My gloves didn’t afford much dexterity, making it difficult to manipulate the straps on my *rental-pack-from-hell*. I asked the guide if it was safe to leave things in the car to which he responded with a quizzical look. I glanced around – there was nobody else in the car park. It was winter, we were in the Andes. If it wasn’t for the signs, I would never have guessed that the clearing that we were in was a car park. Apparently, there were lines on the ground, but they were presently covered with snow which came up to our ankles. It was dark. We had driven since 4:30am and were now at the edge of the Lanin national park. The Lanin volcano, at 3770m, was still some distance away but that distance was now to be covered on foot. It was cold – very cold. The sky had been crystal clear all night and our fingers barely retained the manoeuvrability required to complete some of our otherwise-simple preparation tasks. It took us almost 20 minutes to adjust my crampons. Just short of 8am and with the sun still well below the horizon, we set off into the forest which surrounds the volcano. In six hours, we would reach the mountainside refuge where we would stay the night to rest and acclimatise before scrambling the 14-hour round-trip from there to the summit and back. Lanin is not a technically demanding climb, the slope only occasionally exceeding forty five degrees, but it is certainly no walk in the park – national park that is. Before long we would require our crampons and ice axes to traverse the many icy slopes which lay between the base and the summit. The first day was gentle. The sky alternated between overcast and partly cloudy and there was barely a whisper of wind. As far as precipitation was concerned, it snowed the snow-equivalent of spitting. Just teasing us every now and then with a subtle spattering. The refuge was at 2260m above sea-level. It seemed a fair way to go for just one day but I was reminded that the car park where we started is at about 900m above seal-level so, in actual fact, the refuge was about half-way up the mountain. 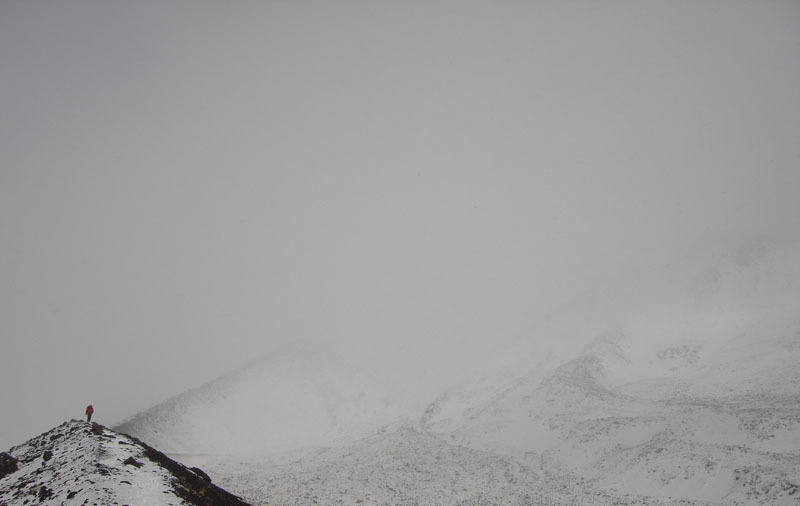 Even so, it was at a decent altitude and from the base of the mountain, it was not visible as it was above the clouds. As the least experienced climber of our group, I was given the responsibility for carrying most of the food because it was relatively light. This also meant that I had unlimited access to an impressive assortment of sweet biscuits and nuts which we paused frequently to consume. We reached the refuge just after one in the afternoon. It was a small orange building which looked like a mini-bread roll. A flag pole with a rag flapping from the top which I later learned to be a very worn Argentine flag stood a few metres away. The interior of the building could be described as “Spartan” but it did protect us from the cold and the snow. My guide, visibly pleased by our rapid ascent, prepared a light lunch and told the group (which was made up of myself, himself and a buddy of his who thought it would be fun to tag along) to have a little nap afterwards and we would do some activities later in the afternoon if the weather was good. We woke up at three to the sound of clinking crampons. 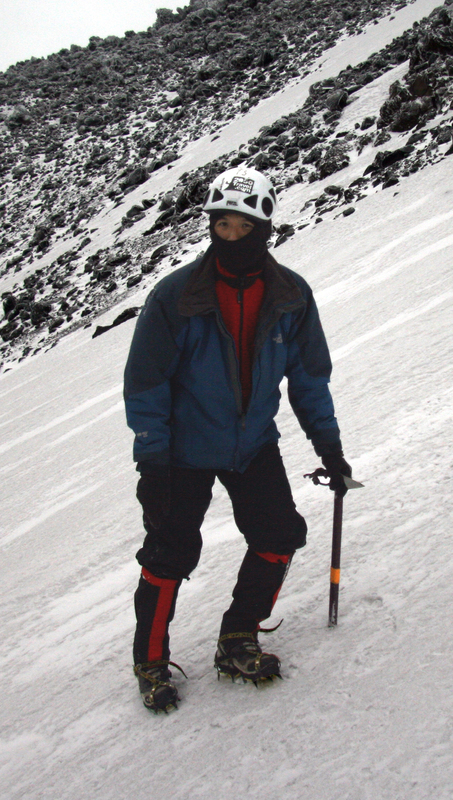 We grabbed our gear – crampons, rope, ice axes and helmets, and proceeded to ascend a further few hundred metres to the steepest part of the slope. As we trudged along I couldn’t help but notice the odd frozen shrub jutting out from under the rocks. I could scarcely believe that things could grow here; at temperatures where things generally had a tendency to shrink. The slope at this point was very steep indeed, although not quite steep enough to require the use of all four limbs at all times provided that one had a sufficient level of grip. Given that this part of the slope was also very icy, grip was not always easy to come by, unless of course you had crampons, which we did. Crampons reminded me alot of very old-school roller skates but without the wheels. Instead, ten steel spikes protruded out and, one would imagine, into the ice giving you grip where previously there was none. My guide quickly went through the basics of walking up and down a slope with crampons and explained the subtle nuances of how not to kick yourself with your own sharp metal spikes – a valuable lesson. Then came the fun part of the afternoon – a lesson in self-arresting. The self-arrest is a standard manoeuvre used to control and (hopefully) halt an unplanned slide down an icy slope. Seeing as the mountain that we were planning to summit was just bursting with slippery, icy slopes, this seemed a very appropriate lesson to learn. The idea of the self-arrest is orient oneself so that one is sliding feet-first and facing the slope. Once this was established, with one hand placed on the “axe-bit” and one on the handle, one would bring the pointy-end of the ice axe to bear on the slope. Then the axe would dig into the mountain and (hopefully) bring you to a stop. The theory was simple enough. Putting it into practice required some… well… practice. Despite the obvious dangers, I found it altogether too much fun sliding down the side of an icy mountain. Maybe it was the altitude, maybe it was the fact that my waterproof-overpants weren’t actually mine. In any case, we spent about an hour rehearsing the manoeuvre from every conceivable position (that was not a dirty joke) until my guide was satisfied that, if I were to fall to my death, that he would not be held responsible being able to cite that he had taught me how to self-arrest. As we walked back to the refuge, I looked to the west because, not only was the sun setting and turning the sky a bright orange, but that was where the wind was blowing from and thus, where the weather would come from. It looked overcast. Oh well. We got back to the refuge and cooked ourselves a delightful meal of ravioli Bolognese after which we quickly got to task of catching up on the sleep that we had missed from having to wake up at 4am. I woke up at 6. Although I had gone to sleep at 8, I did not feel well-rested. It was probably a combination of the altitude and the sound of the wind buffeting the sides of our little building. I walked over to the door and opened it, and then I very quickly closed it. It was snowing very heavily and, not covering my mouth to yawn as I opened the door, I copped a mouthful of the white stuff. The snow outside the door was also about waist-height, which turned my trivial early-morning toilet break into a mini-odyssey in itself. After having a bit of breakfast, my guide took another look outside. The snow that I had shovelled out of the doorway had replenished itself and was now back to waist-height. This was a problem. After waiting for a bit and a having brief chat, we agreed that we had two realistic options. We could wait for a few more hours and hope that the weather improved (not likely, given that it was the start of winter), or we could pack up our stuff and begin our decent now in case the weather didn’t change or got any worse. Although we all agreed that it was unlikely that it was going to get any worse (mostly because it was already quite terrible), we came to the unanimous agreement that we should begin our descent as soon as possible. Our food would only last us until the end of that day and, although the park rangers were aware of this and our presence on the mountain, starving on the mountainside and needing to be rescued was not my idea of fun. The weather was very bad. I was not aware that weather could get this bad. Stinging particles of snow bombarded us from the side. I was wearing a balaclava and only the smallest portion of my skin was exposed to the outside world… but it hurt. My face was still red for several days afterwards. The wind was so strong that we had to lean into it otherwise we would literally be blown over. As if that wasn’t bad enough, the wind frequently changed direction and, when it did, one or more of us would be blown over and disappear briefly into the deep snow. Apart from the snow getting in my eyes making me reluctant to keep them open for very long, when they were open, they could only see for about five metres before everything was obscured by white haze that surrounded us and threatened to swallow us. My first instinct was to turn back. I probably would have if it weren’t for the knowledge that, if I did, I would probably be stranded in the refuge until I became so weak from hunger that I would require rescue, or starve to death. Looking back, it probably wouldn’t have come to that because Lanin, although not a trivial climb, was also not a remote one. We would probably have survived at least another two days by which time the worst of the weather would almost certainly have passed. But today, we were blown off; almost literally. As we descended, it became less windy although the snow persisted. I was thankful for the increase in visibility. For the first hour or so, I had only been able to follow my guide by tracing his footsteps because I could only occasionally see him. Now, I could actually see where I was going. As we made it to the plain that separated the volcano from the forest that surrounds it, we let out a collective sigh of relief. It was still very windy, but at this altitude there wasn’t as much ice and snow about for the wind to blow into us. I paused as our path crossed a set of fresh animal tracks. “A puma” said my guide. Excited, I indicated that I wanted to stop briefly to take a photo. He indicated that there were times when it was ok to stop and there were times when one must press on with utmost haste and that this was one of the times which fell into the latter category. I understood, and pressed on. I’d barely had time to pop my ears when we made it to the relative safety of the forest. Here it was not so windy and I was able to remove my balaclava; parts of which, by now, had become soaked with my nasal fluids and frozen over making it difficult to breathe. When we finally got to the car, we were quite wet and our fingers were so cold that we could barely operate the door handles. We somehow managed to get in, defrost and make our way back to Bariloche from where I would eventually take a bus to Chile, my final country before returning home to Australia. I’ve read somewhere that when climbers fail to reach the summit of a peak, there is a very Freudian response which is akin to sexual frustration and may manifest itself in the form of unintentional sexual innuendo. I don’t know what that’s all about, although I didn’t go all the way, it was certainly very hard most of the time… and quite satisfying as well. Admittedly, it would have been nice to get to the peak and I was ultimately left wanting more. I’m definitely coming again and making sure I get on top. Those who remember my first excursion to South America will remember that I was in and out in just over a week and didn’t get to see much (I was there to compete in speed skating world championships) and so I promised myself that I would return and see Angel Falls and Machu Picchu – which I did. Now, with winter setting in and another attempt on Lanin impossible, I must now reluctantly admit defeat at the hands of the Andes and vow to return, (in summer next time), to settle the score. (Anyone care to join me on an attempt on Aconcagua?). Since Ushuaia (where our story actually left off), I took a bus to El Calafate and got a good look at the Perito Moreno Glacier – a curiosity among glaciers in that it is advancing rather than retreating. I must say again that I am very impressed by the tourism infrastructure here because every night, I would stroll into town, walk into a travel agency and say (in Inglespanol) “hi, what tours do you have running tomorrow? Oh, I don’t have much money…”. Being low-season also helps because nothing is booked out and tour operators are very eager to give discounts because empty boats and buses aren’t good for business. By Bariloche though, I was starting to get a little tired of being on the standard tourist bandwagon so I decided that I would do something where it would be unlikely to have to put up with posing tourists getting in the way of the view. I was also attempting (albeit failing) to satiate my insatiable hunger for adventure. With less than a week to go, I’m feeling a bit sad that I have to leave this place. South America is a truly wonderful continent and I was surprised at every turn at how many absolutely magnificent places I would come across which I had never heard of before. The people here are very warm and friendly (yes, even people from Argentina who apparently have the unenviable reputation of being the “French” of South America). I am, however, ready to come home, satisfied that, given the constraints (time, money and, occasionally, the weather), I have probably made close to the most out of this trip.